The start of the school year is just around the corner, so to make sure you get your fill of summer fun, I&apos;ve put together a list of fun activities happening in Hendricks County, Indiana, this last weekend in July. Take a break from cooking and head over to the Avon American Legion from 4:30-9 p.m. for some fantastic food truck fare. This event includes free parking, entertainment and activities for kids. 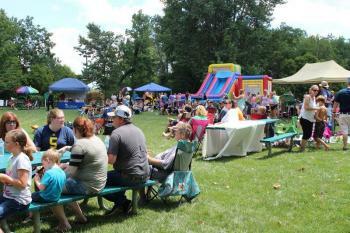 Get your groove on at Washington Township Park in Avon from 7-9 p.m. Friday. This week&apos;s free Concert by the Creek will feature the Alternative Rock group Guys on a Bus. This up-and-coming group from Joplin, Missouri, will make you get up and dance. Check out their fun music featuring four-part harmonies. Food and beer will be available for purchase at the concert. Come early at 4 p.m. to hear local bands from the Launch Pad in Plainfield. The 3rd Annual Play&apos;nfield in the Park Performing Arts Festival will include performances by The Biz Academy of Musical Theatre, The Children&apos;s Ballet, Circle City Chamber Choir and The Hendricks Civic Theatre. The event will also include a Kids Zone, plus food trucks and craft beer and wine. The event will take place 4-9 p.m. at Hummel Park Performing Arts Center in Plainfield. All events are free and open to the public. For the first time ever, Beasley&apos;s Orchard will host a Peach Party providing visitors samples of Beasley&apos;s homemade peach pie, homemade peach cobbler and other peach products for free. Plus, guests can pre-order half-bushels of peaches at a discounted rate. Admission to the orchard&apos;s kids area, the Barnyard Bonanza, is also free. The event will be from 9 a.m.-6 p.m. Saturday at Beasley&apos;s Orchard in Danville. More free fun can be found at the Hendricks County Historical Museum from 2:30-4:30 p.m. Sunday. The museum will serve up free ice cream, iced tea and lemonade on the museum lawn. In addition to refreshments, there will also be games for children and live music. Also, if you have never been inside the museum, this would be a great time to experience it as free tours will be given during the event. These are just a few of the many events happening in Hendricks County this weekend. Be sure to check out our Events Calendar anytime for more fun events.